2009 was setting up to be a good year for fat people. Oprah had elected a President. Rush Limbaugh was being heralded as the leader of the Republican Party. A fat and unemployed virgin in Britain impressed Simon Cowell with her angelic voice. Not since the nineties with Bill Clinton in the White House and Roseanne on every TV had tubby been seen as cool. United Airlines, who should be more worried about keeping their planes in the air has announced a new policy. Starting in Chicago, the home of Oprah and huge portions, those deemed overweight will have to pay for an extra seat on United flights. 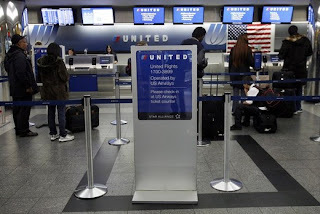 The definition of overweight for United are people who can't fit into a single seat in the ticketed cabin, buckle their seatbelt or put the armrests down when seated. If chubbos fit one of the criteria they will have to pay for an extra seat or if the flight is full wait for the next available flight. United Airlines claims that this is due to the many complaints they receive from people who have had an unsatisfactory flight due to big boned seat mates. They don't include the number of people who have complained about legroom, poor food, bad inflight movie, deaths and other misadventures on United. While like most people I hate having a chubby neighbor while flying this new policy adds new sources of revenues for today's failing airlines. They could institute a charge for tall people banging the back of my seat. There could be a smell charge for those with bad b.o and make a mess in the bathroom. Then they could go about tackling my biggest pet peeve. A charge to muzzle crying babies. This comes hot on the heels of Ryanair thinking of charging people to use their washrooms. Why is I that airlines blame high fuel costs or low fares for their failure. How about cleaning those toilets first and then charging me to use them. They could go along way by just treating people like human beings instead of cattle. Well they can treat fat people like cattle. They take up way too much space.